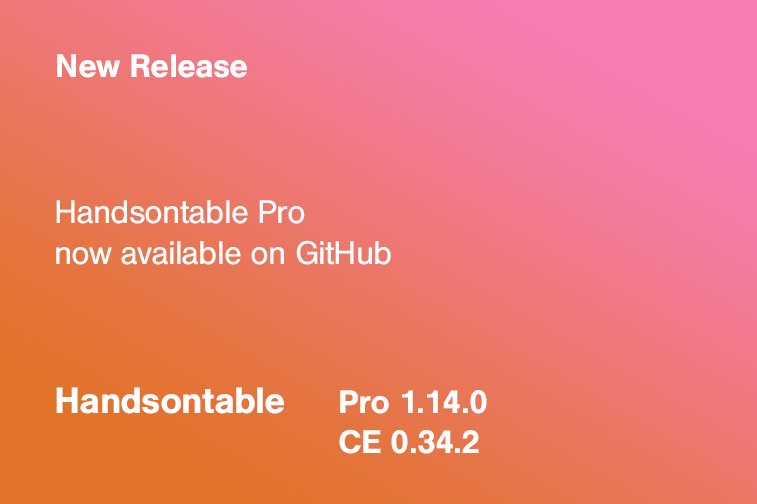 Today we released a new version of Handsontable Pro (1.14.0) and Community Edition (0.34.2). Among others things, we fixed a bug causing a misalignment of an indicator when moving fixed size columns. Fixed a problem with incorrect usage of the test method in the hasClass polyfill (#4508). Fixed a bug, where zoomed-out Chrome made the table impossible to scroll (#4502). Fixed a problem with misaligned indicator in the Manual Column Move plugin (#4496). Fixed an issue with Handsontable’s default export property (#4495). Follow us on Twitter to be up-to-date with all updates to Handsontable. We appreciate all of your suggestions and bug reports that helps us fix issues faster. You may want to leave a comment or contact us to help us make Handsontable even better.